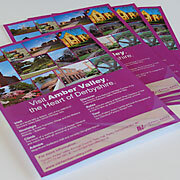 The heart of Derbyshire is the perfect place for those that like the outdoors with many activities in the Amber Valley to keep you entertained and get you out and about. Get your swing action ready by trying your hand at one of our golf courses, experience a gentle cycle ride along the Midshires Way or turn to the rod and line if you prefer a more gentle pursuit. The Autumn Walking festival takes place in September. Why not join in one of the free guided walks and learn about the history of the area. Local leaders offer excellent knowledge and interesting facts along the routes. We also offer activity breaks for those wishing to indulge for a weekend or for those special occasions why not try a balloon ride and discover more of the beautiful countryside or participate in the relaxing range of art workshops and painting courses on offer. If you are unable to find the information which you require on our website, you can contact us by post, email or by phone. Alternatively please complete our online Customer Contact Form which will be sent straight to a member of our Tourism Team. If you wish to give feedback on our website then please complete our Website Feedback Form.